Business phone systems for franchises. There is a lot that goes into running a franchise, from managing supplies to staffing to budgeting. Reliable and affordable office phone service is one of the most important things that franchise managers will need to consider when running their business. What do franchises need from a business phone system? If you’re operating a franchise, you will want to keep branding initiatives that meet your company’s standards. Supporting growth and revenue at your franchise location is also important. Constant communication with employees at your franchise as well as upper management is key to your success, so you’ll need a business phone service that helps you meet these goals. Whether your franchise is a sandwich shop, hotel chain, financial firm or a convenience store, keeping customers happy is also key. You need a phone system that can effectively greet customers, direct calls, and provide basic information like your location and business hours. And, you will also need to be able to easily communicate with other franchises at your company. Finding the best business phone service while staying within your budget is perhaps the most important part of your business phone selection. 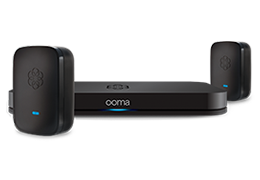 That’s why Ooma offers more than 35 advanced features at a low monthly rate of $19.95 per user. No surprise add-ons, or installation or setup fees. See how much your franchise can save by using our interactive savings calculator. See how this sailing school was able to manage 3 business locations while saving $1,200 a year on business phone costs with Ooma Office. Unlimited calling to Mexico, Canada and Puerto Rico: Many companies manage franchises outside of the U.S. Ooma Office offers free unlimited calling to the above countries, and low-cost international calling to many others. All-inclusive price: If you have several franchises to manage, you might be paying too much for multiple phone lines, extensions and add-ons with your current service. With Ooma, each account comes with local and toll-free number of your choice (you can even port an existing number), a virtual fax extension, and a conference extension line. Multi-level virtual receptionist: Route calls to the right franchise location, and manage your inbound calls more effectively. Create business hours and afterhours settings and greet customers – this is the best way to help your company look polished and stay organized. Free toll-free and local number: We can port over your existing business number, or you can choose a new one. This feature allows your customers to have one business number for multiple franchises, and it makes your company look more professional. Mobile phone access: The Ooma Office Mobile App allows you to take calls from your business line on your smartphone. This way, you’ll never miss a customer or supplier call, even when you are away from your desk. This feature is great for managers who are running multiple franchises on-the-go. Easy DIY setup: With the Ooma Office setup, you can scale your business phone system at your franchise locations quickly and easily with our convenient DIY setup. And, there are no unexpected setup or installation fees. Get the business phone system that can help you manage business communications at your franchise locations with ease. Visit our main business phone services page to learn more about features, benefits and pricing. Watch the video below to see how a headwear shop was able to cut down on costs and manage locations in the U.S. and Canada.